Waterjet cutting technology is a unique, advanced level of automation able to cut almost all materials cost effectively. Waterjet allows tremendous flexibility and versatility in manufacturing and provides for more cutting possibilities. Simply put, "Waterjet is by far, the most flexible and desirable technology in our business and delivers results with amazing reliability", says one of the proud waterjet & laser job shop owners. 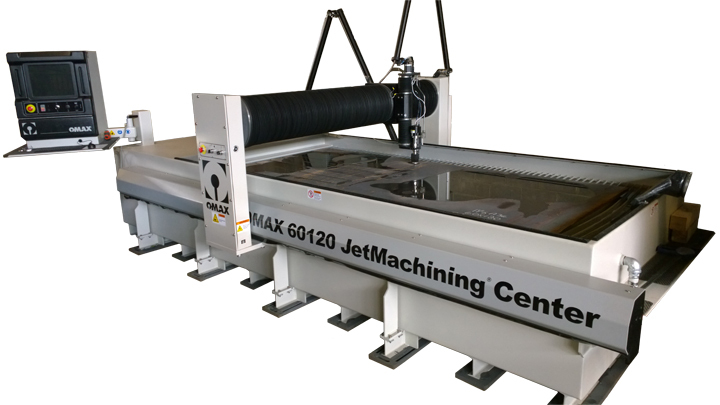 The OMNIMAX 60120 JetMachining Center™ is a revolutionary concept in waterjet cutting. It incorporates a servo motor directly enveloping a high load, precision ball screw. The ball screw directly houses the ceramic plungers, which reciprocate back and forth to create the pumping action, in much the same way as a hydraulic cylinder works on an intensifier pump. The infinite control of the servo motor and precision of the ball screw, enable extremely accurate control over the output pressure and volume of the water displaced, and eliminates pressure spikes when deadheading. This infinite control gives an operator the ability to program virtually any pressure and flow rate from zero to full capacity, while only using the power displaced at the cutting head.